What does it take to fit out a 150,000 sq ft project? Discover what goes on behind-the-scenes in a large scale office fit out in our latest infographic. Ever wonder what goes on behind-the-scenes of a large-scale fit out? The answer is enough data cabling to do a marathon course, more than twice! 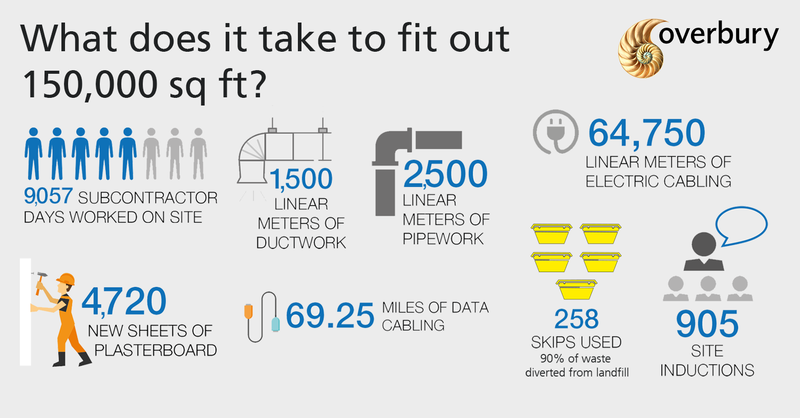 On a recently completed project Overbury's Southern team, the numbers show just how much goes into large-scale fit outs. Thousands of sheets of plasterboard, dozens of miles of cabling, thousands of metres of pipes and ductworks as well as hundreds of skips – with 90% of waste diverted from landfill. Alongside all of this, 905 site inductions were held to bring clients, visitors, suppliers and subcontracts up to date on the project-specific details and site health, safety and wellbeing.